Love these pillows. The longer you have them the plumper they seem to be. It’s a very good quality pillow. They are comfortable and supportive , while not being bulky. Crafted with a 100 cotton outer shell and polyester inner liner, this double layered fabric design is used to act as a barrier to the feel of feathers. Set includes two pillows, each filled with 10 goose down and 90 goose feather. 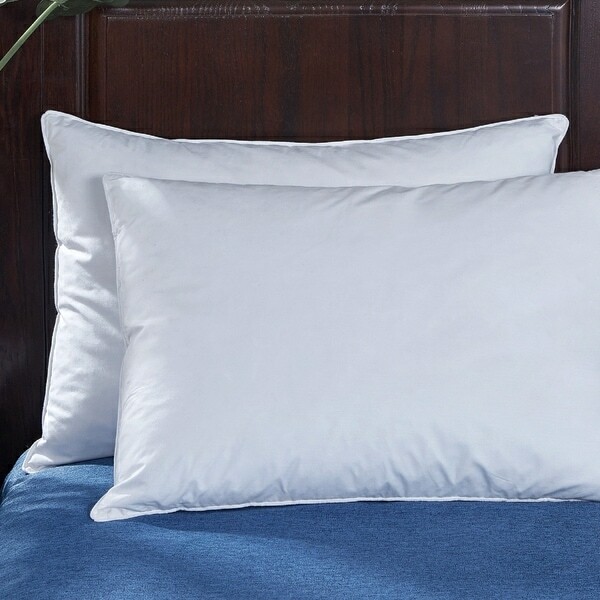 Pillows are made from 233 Thread count 100 cotton with inner polyester liner. Filled with 10 Gray Goose Down, 90 Gray Goose Feather. Spot Clean, Dry Clean Recommended. Materials are Responsible Down Standard certified and cleansed by Oxipower technology. Dimensions 28.0 In. X 20.0 In. X 3.0 In. These pillows are pretty flat. I’m fine with them but my husband was not happy. They are soft but they are but fluffy. Just be aware you won’t have a lot holding up your head.